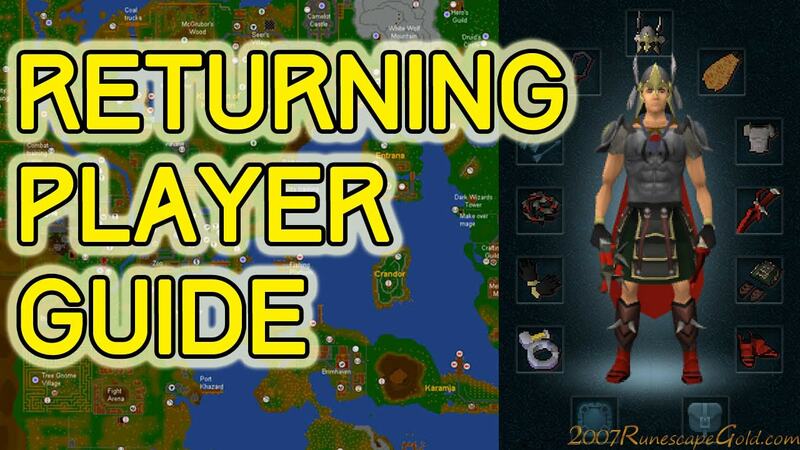 Ever since RuneScape originally came out there have been a lot of changes and I mean A LOT! You can almost bet that every single inch of this game has changed if you were playing it back in 2007, but that doesn't mean you can't jump back into the game you once loved. A lot of your previous knowledge and skill will have a place in the latest version of RuneScape, but anything that you find lacking you will manage to find further on in this guide. First and foremost, this right here is a tip for anyone who is returning to the game for the first time in years: download the client and do not play on a browser. The original draw to RuneScape was that it was a browser-based MMORPG and while the developers do still provide support for the browser version of the game, it is still recommended to download the game via the client. Overall, it would lead to a much smoother and entertaining return to the game; something that the browser version may put you off from – which kind of defeats the point of returning to the game in the first place. As already stated, the combat triangle still remains the same, but there's a completely new interface for you to thrust yourself into that you're going to want to learn. No longer do you just click on an enemy and wait until one of you keels over and dies. Instead, you've got a vast array of abilities that you have to activate to do some truly significant damage to your opponent. These abilities come under the hue of basic, threshold, and ultimate abilities and they all have their requirements to use. When it comes to basic abilities you can use them pretty much however you see fit and whenever you do use one, your "adrenaline" goes up by 8% and once you've got at least 50% you can cast a threshold ability that will drain about 15% of it. If you manage to save your adrenaline all the way up to 100%, you can cast an ultimate ability that will do a considerable amount of damage, but will drain all 100% of your adrenaline. Looking at it in writing may seem a tad confusing, but I can assure you that when you try out this new combat system for the first time you'll get the hang of it all very quickly. On your return to the game you're going to find a whole bunch of new quests that you can do at your own leisure, but for the most part they can be done in any particular order; unless you are trying your utmost hardest to chase after that one set of armour you haven't got yet. One thing that most assuredly will matter however is going to be your skills – especially the basics, like mining, cooking, and woodcutting. There are a lot of skills – both new and old – and many of them you're going to want to put some time into for a whole bunch of different reasons, with the main one being that in the long run; at least in the beginning anyways, it's going to make you the majority of your cash. After all, there's only so much profit you can gain from randomly picking stuff off of the floor and begging; don't beg, though! No one enjoys it and everyone involved just feels weird at the end of it. Earn yourself some cash the proper way and you'll step away from your computer that day feeling like you've actually achieved something; a feeling that you won't want to miss out on. Lastly, if you're not quite sure how much time you're going to dedicate to RuneScape, stay as a free-to-play player, before you even consider becoming a member. While the F2P part of the game is fairly restrictive, for those just starting out again there's a lot for you to appreciate and enjoy without parting with some hard earned cash from your wallet. Make runescape money for F2P, you can view this. If by any chance it turns out that you're in love with the game then it might be a pretty good idea to become a member, but on returning to the game, just stick to the F2P side of things for a little while – at least until you get your bearings on what it is you want to do with the game overall.